Every once in awhile a book comes along that is truly exceptional. A perfect rating does not seem like a good enough way to commend the author. Every once in awhile a book comes along that has the reader talking back to the book while reading it; maybe with replies of, “Amen! Absolutely! Finally, someone understands!” Every once awhile a book comes along and makes the reader feel like they are meeting one on one with the author. Breathing Room is that book. Often Christian books are encouraging but not always understanding. They provide an encouraging word but rarely have I found, as a reader, that they truly speak about the suffering in such a way that does not minimize it or gloss over it. Rather, Leanna Tankersley gets in the knee deep pain right along with the reader. 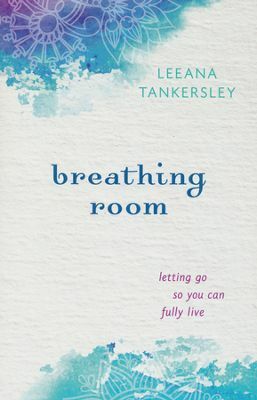 Breathing Room speaks wonderfully to women in many stages of life — from a new mother to a matured wife to a new believer. With quotes from many different areas, Leanna Tankersley applies literature and wisdom to each chapter with practical understanding from real life experiences. I loved when she spoke about homesickness, being overwhelmed and just needing to breathe. She uses scripture throughout the book as well as stories from The Bible and gives them real life application. To say I enjoyed Breathing Room is such an understatement. It is a book that I will keep on my bookshelves and one I’ll gladly share. It’s a book that is applicable to every age group and one that moved me beyond words and into a new area of acceptance. I recommend it, I loved it and in a rating system of five stars for the best book, I’d give it 10. I received this book from the Book Club Network in exchange for my honest opinion.